Alternative Spring Breaks are designed to give students something more meaningful to do during their week off, rather than just spending time at the beach or sitting at home catching up on school work. 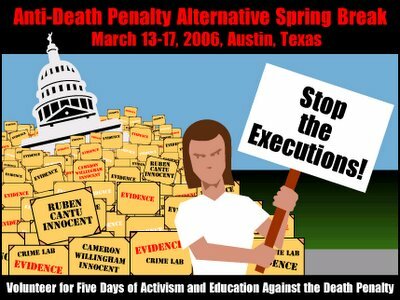 The specific purpose of this Alternative Spring Break is to bring students to Austin for five days of anti-death penalty activism, education and entertainment. We will provide participants with workshops that will teach them skills they can use to go back home and set up new anti-death penalty student organizations or improve ones that may already exist. The skills participants will learn can also be used in other issues besides the death penalty. Activities include a Death Penalty Issues Lobby Day and a direct action day. Students will gain valuable training and experience in grassroots organizing, lobbying, preparing a direct action and media relations. They can apply what they learn against the death penalty or in their activities involving other issues. Although the majority of the participants will be students, it is also a good opportunity for young people who are not students to become active. There are after all lots of young people who for various reasons don’t go to college, but who may want to do something against the death penalty. The events and workshops are also open to the general public of any age, although the housing should be reserved for young people. Chaunte Sterling, a senior at Sam Houston State University (SHSU). she is the vice-president of the chapter of the National Association of Blacks in Criminal Justice. Participation in the Annual Anti-Death Penalty Alternative Spring Break is an invaluable experience. Participants will come away with firsthand knowledge of the anti-death penalty movement, a new perspective on issues facing our country, and new friendships that will last a lifetime. During the spring break students will find plenty of free time to enjoy Austin, the Live Music Capital of the World.